The Killing Floor differs from The Infection a bit in style. While The Infection jumps between characters’ perspectives, most of the ensemble sticks together, providing a single stream storyline. The Killing Floor is a much more ambitious story in that the main characters are broken into several groups, which all have their own storylines and themes. It also follows many more characters. This technique can often be challenging for newer writers, as it takes balancing chronology to tell a coherent story, and it takes discipline to give the reader what’s important to know, else the novel risks running hundreds and hundreds of pages. The Killing Floor never misses a beat here and keeps us engaged and pushing the story forward. It never is confusing in the sense that we aren’t quite sure how to distinguish characters or settings even though it jumps around often. It never is scant on the details. Overall, it gives us a really well-done wide-angle view of the world DiLouie has created and the characters he so obviously loves. The characters make DiLouie’s stories stand out in the sense that, while it isn’t completely without plot devices, it’s character-rich fiction. The stories are driven by both plot and character, and that’s really how genre fiction is meant to be. It’s an interesting world with interesting people, yet so many genre writers lose themselves in their worlds and forget to include interesting characters. DiLouie does not fall victim to that pitfall. Over the course of at least DiLouie’s last three books, he seems to have a fascination with the U.S. armed forces and the idea of fighting wars in the Middle East only to be called home to have to fight on U.S. soil. It’s a recurring theme, even in his zombie novel that predates The Infection, Tooth And Nail, which also is fantastic but has no relation. Service men and women are a big part of his stories, and as such, DiLouie seems to have done due diligence to make the dialogue and facts as authentic as possible. I’ve read some other reviewers who have criticized his stories for being inaccurate, but having never had the honor to serve our country in that capacity myself, it at least appears to me that this aspect of his writing is authentic, and it seems he’s dug even deeper in The Killing Floor. When it comes to the zombie genre, it’s clear Craig DiLouie is writing exceptional material. 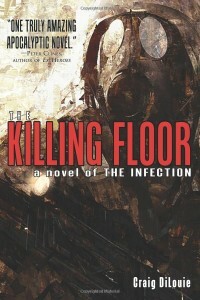 The Killing Floor is a frantic yet focused read. It moves your heart and your mind, and short of a few typos here and there (which, as an editor myself, I can say it’s nigh impossible to squash every typo if you’re working on a deadline), it’s clear DiLouie put painstaking effort into ensuring every word and detail was exactly what he wanted. I stopped after many chapter and section breaks just shaking my head at how good the scene I’d just read was. The Killing Floor is as perfect as the end of the world gets. If you’re a fan of the zombie or apocalyptic genres, I highly recommend The Infection series and The Killing Floor in particular. If you’re thinking about getting into the genre, you can’t go wrong by starting with Craig DiLouie. His writing stands out as both entertaining and thought-provoking. It’s always good to know when you invest in a series and a writer that it starts on a good note and only gets better. The Killing Floor is a testament to that and what we can look forward to in the future from Craig DiLouie. Tagged Apocalyptic, Books, Craig DiLouie, Horror, Reading, Reviews, Zombies.